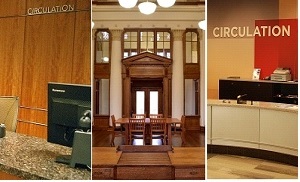 The Access Services Department provides a variety of core library services from multiple locations. These services include Circulation, Course Reserves, Document Delivery, Shelving and Stacks Management. Our staff manage service points at the Main and Science Libraries, the Media Desk in the Main Library, the Carnegie Library Learning Center, and the UGA Libraries' off-site Repository. The Art Library at Lamar Dodd, the Curriculum Materials Library at Aderhold Hall, and the Music Library at the Hugh Hodgson School of Music house course reserves for their departments and are pick up locations for GIL Express and the UGA Libraries' retrieval and delivery services.